Style, dexterity, the ability to manipulate a smartphone without dropping it during a selfie—there is a lot to look for in a good pair of gloves. But the most important category of all, warmth, can trump all those in about five minutes of sub-zero chill. Numb digits can spell disaster on even the most perfect of powder days. But fear not: the Active Junky's Winter Gear Guide team took to the slopes of Chile this past summer in a quest to find the best possible gear to keep you warm, dry and killing it all season long. 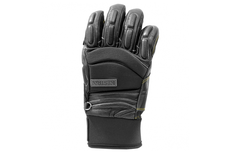 Our testers rated these mitts for their temperature control, moisture management, comfort, dexterity and toughness. These five best tested gloves from our Winter Gear Guide guarantee you wouldn’t be sacrificing warmth for style, or vice versa, any time soon. Click HERE to see the 5 warmest gloves for this winter.